The important contracting company, Cloisall Co. (L.L.C. ), specialised in interior design and turnkey projects, are the distributors of the compact mineral from PORCELANOSA Group, KRION®, in the United Arab Emirates (UAE). In this project in Abu Dhabi, they have also been in charge of transforming KRION®, and have overcome the complexities of this spectacular work. 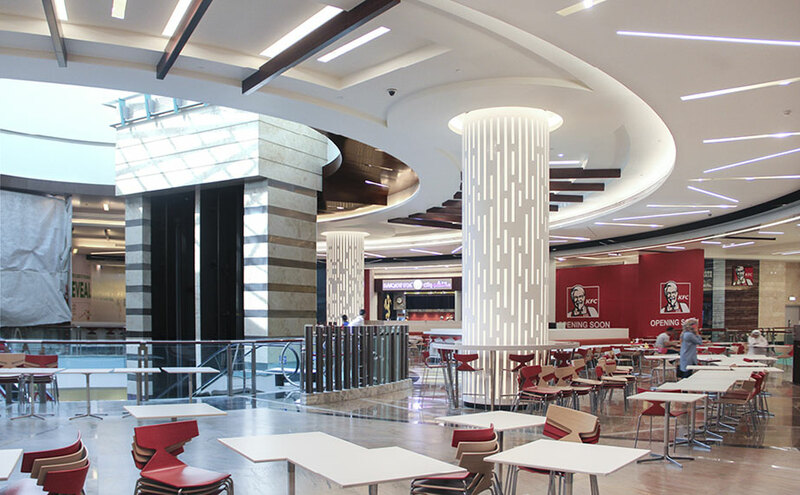 Abu Dhabi Mall Food Court is a shopping centre which is home to the best commercial brands and the main restaurant franchises. It is in this sector that Cloisall has developed their project in which KRION® plays an active part. The curved, machined and backlit columns are made with KRION®, 1100 Snow White, our star colour, and an ideal colour for high transit areas such as this due to its easy cleaning, reparability, and being anti-bacterial without additives, among many other properties. We can also find KRION® from the Royal+ 9103 Bright Rock series in the shelves supported by metallic structures which surround the columns, the room separators which also work as a high table for stools, the backs of sofas, and the curved counters which separate the transit area from the restaurants and the dining area.